The thing is, the game itself doesn’t look a whole lot like the hand-drawn cover art – until now, that is. A blogger who goes by TheAkrillicTimes found a way to get the original Doom to look much more like its inspired cover, which features the Doom marine standing atop of pile of demons. 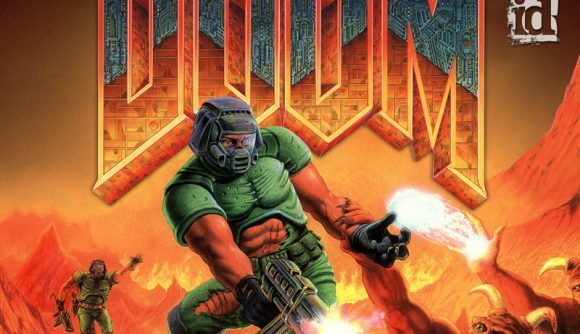 Using a neural network, which allows a computer to create images with ‘deep learning,’ as well as the wads Thunderpeak and Smooth Doom, the blogger managed to create a pretty sweet-looking recreation of a hand-painted look for Doom in-game. The clip posted to the KingdomAkrillic tumblr shows off the results, and they look trippy and amazing. It’s a quick firefight between the player, an imp, and a hell knight, and the color palette is constrained to the streaky reds, oranges, and blacks you remember from the Doom box. You may have noticed that there’s a catch – this isn’t something you can install and play, unfortunately. Using these techniques required six hours and five minutes of render time on a GTX 1050ti, and that was just to create the 306 frames that make up the 15 second clip. So sadly, this Van Gogh vision of Doom isn’t actually playable. At least not yet. Still though, you can’t deny that it looks terrific.